Anyone can cook up some hash browns and pork chops but it takes a special person to bake them in a casserole. I have never been much of a fan of hash browns and pork chops. Don’t get me wrong, it’s not that I don’t like them, but rather if I had to choose a meat I’d choose beef or chicken. However, there are some exceptions that have been made such as this hash browns and pork chops casserole. One of the things that I liked most about this recipe was the hash browns. I much prefer hash browns over chunky potatoes. To me, those little hashbrowns really made the meal. I absolutely love this hash browns and pork chops casserole! It’s savory, zesty, and covered in French’s French fried onions. Yum! Plus, it’s very easy to make and economical as you probably have a lot of the ingredients in your pantry. Who’s gonna make this with me tonight? USE THE RED NEXT PAGE LINK BELOW FOR THE HASH BROWNS AND PORK CHOPS RECIPE. 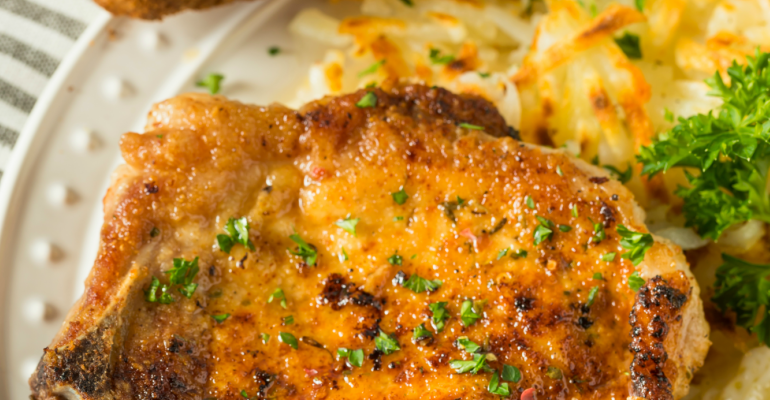 Quick Tip: You can also make this recipe with chicken breasts.